Add a touch of nautical styling to your outdoor spaces with the Devonport Round Bulk Head Light. 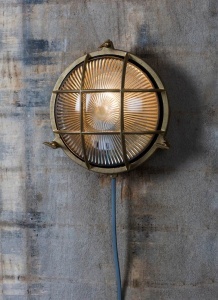 Crafted in Brass the striking gold colouring offers an alternative to our Hot Dipped Galvanised lighting and will add a vintage aspect to the home. The 1920s and 30s style is apparent with the ribbed glass shade which will allow the light to shine through beautifully.